Weak Bond Market Stunts Hospital Construction When nonprofit hospitals need money to modernize their emergency rooms or build a new wing, they go to the bond market. For five weeks in September and October, the hospital bond market essentially shut down, poisoned by the mortgage crisis. Meanwhile, hospitals have had to scale back construction plans. 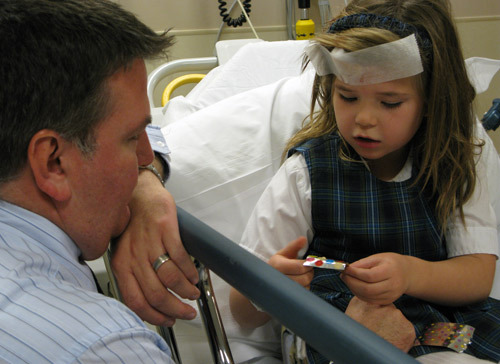 Joe Sullivan and his daughter Jane in the emergency department at St. John's Hospital in Maplewood, Minnesota. The hospital would like to build more rooms, but it can't because the hospital bond market has become dysfunctional. Nonprofit hospitals issue bonds to finance new projects or restructure existing debt. But this past fall, confidence in the bond market was low, and there were few buyers. 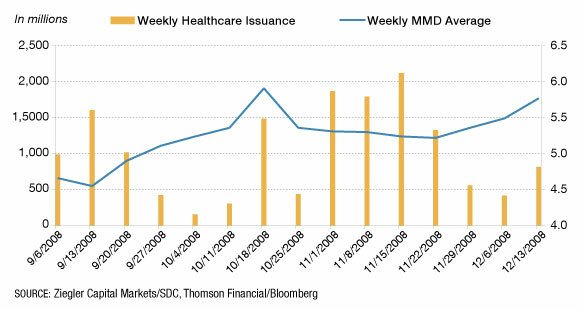 Hospitals that wanted to issue new bonds had to offer higher interest rates (weekly MMD), and many hospitals decided to hold off. That means delaying hospital improvements. The weak bond market is hurting nonprofit hospitals nationwide — keeping many facilities from issuing the bonds they need to raise money for everything from new construction to the purchase of computer equipment. In November, Moody's Investor Service dropped its outlook for nonprofit hospitals from stable to negative. This move could raise the rates hospitals have to pay their investors, since investors will see hospital bonds as riskier. And a survey by the American Hospital Association that same month found that about a third of hospital financial officers said they were paying higher interest rates on a type of bond called a variable rate demand bond. Hospitals depend on several sectors of the bond market: traditional fixed rate bonds, which used to be considered low-risk; auction rate bonds; and the variable rate demand bonds, or VRDBs, which are usually insured and are riskier for the hospitals because their rates change as the bond market goes up and down. Because of the bad bond market, more than half the hospitals surveyed are reconsidering or postponing building projects; 45 percent are cutting back on buying new technology and equipment; and 39 percent are cutting information technology. 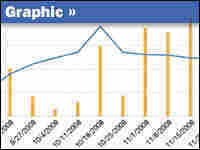 Yet President-elect Barack Obama is counting on information technology to cut the nation's health care spending. The problems also come at a time when hospitals across the country are dealing with more patients who've lost their jobs and health insurance, and can't pay for their care. For St. John's Hospital just outside St. Paul, Minn., charity care costs went up 15 percent this year, and their bad debt went up 71 percent. Meanwhile, hospital officials figured out early in the economic crisis that they were going to have to scale back building plans they had been working on for several years. Hospital officials started doing some strategic planning a few years ago. They knew the emergency department occasionally became overcrowded, and the obstetrics department had to send women in labor to a hospital more than 10 miles away. The hospital also had a huge outdoor parking lot; that's brutal enough in the Minnesota winters — it's extra brutal for people on crutches trying to navigate icy patches. So they planned for $68 million in improvements: an emergency-department expansion, more beds in the obstetrics wing, and a new covered parking lot. In fall 2007, the hospital was getting ready to issue the bonds. "At that point, some of the craziness in the markets started happening," says Bob Gill, the chief financial officer of a three-hospital system of which St. John's is a part. "So we really did a quick stop." Things have gotten far worse in the credit market since then. "We've pretty much put the project on a hold," Gill says. "It's a big disappointment." A complicated set of circumstances destroyed the hospital's expansion plans. To start with, the hospital itself had bought bonds in other financial sectors, including student loan products that tanked when the mortgage bond market failed. It looked as though the investment might be a big loss, but Gill says they'll be getting back some of the money they had invested. St. John's can't sell any of those bonds in today's market, and having them on the books is a liability that could potentially harm the hospital's bond rating and drive interest rates even higher. Then there was the trouble that hospitals were having when they tried to sell their own bonds. Investment banker David Johnson, who is not associated with St. John's, described a domino effect, starting with auction rate bonds. These are bonds with rates that reset regularly through an auction process. They're typically insured, but bond insurers began failing because of problems in the mortgage bond market. And few investors wanted to buy auction rate bonds without insurance they could trust, even if the hospitals selling the bonds had plenty of collateral and good financial records. Concerns about bond insurance and other signs of economic fragility infected the market for variable rate demand bonds. VRDBs have investment rates reset by banks and other entities. Bondholders wanted to get rid of the VRDBs they already had, but no one wanted to buy new ones. It was classic supply-and-demand economics: There were too many bonds and too few buyers. The crash of the auction and VRDB markets, along with widespread investor insecurity, infected fixed-rate bonds like the ones that St. John's wanted to sell to finance its construction project. For a five-week period in September and October, the whole hospital bond market was essentially dead, according to Johnson. For St. John's, the interest rate was 5.75 percent when they were planning renovations, but then rose to 8 or 9 percent by the time the plans were complete. The hospital's bankers couldn't even guarantee the bonds would sell at that high rate. The only good thing about the problems in the hospital bond market, Johnson says, is that it will stop unnecessary building — for example, construction of a new MRI suite or a coronary bypass unit, when there's an underused facility just down the street. Gill says there's no question about the necessity of the hospital's building plans. The project had to meet the approval of the Minnesota state government, which is very strict about limiting hospital expansion. 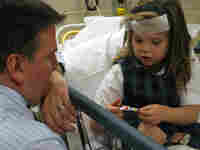 Regardless, he says, the hospital did what it had to do in these tough economic times. "I'm very proud we pulled the plug when we did," Gill says. "I hate to think we would have had to borrow $68 million at a high interest rate." In the meantime, the hospital is doing about $19 million in renovations for its emergency and obstetrics departments, not $68 million. And instead of building an enclosed parking lot, it's running a shuttle bus from the outdoor parking lot to the hospital's doors. And how soon might the hospital bond market turn around so that St. John's can issue its bonds and get going on its plans? Neither Gill nor Johnson would hazard a guess.